It's my first time to join this meme and I am proud to feature this Scenic Sunday my most favorite place. One may thought that there is nothing unusual about this scene. Well maybe yes since only those nearby residents have known its location. 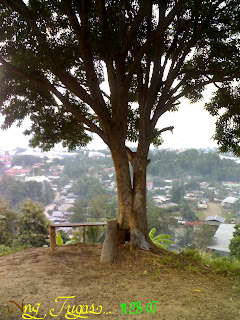 I have been to overlooking places before but this particular place holds a special place in my heart... What's so unique about this tree was its location. it is situated separately from others. The first time that I have been here the sun is about to set. Mind you, sunset is so cool to behold at this kind of place. I was not able to stay that long since it's difficult to go down when it's dark. It was on this place that a covenant was made between us and God. Sad to say, there are rumors that the place will be converted into a commercial place soon, hope against hope may it just remain as a rumor. I wish I could go back there soon. Nice shot of your favorite tree. Looks like a special place to sit and enjoy life! I would love to sit there and write a poem! Such serenity! where is this place?.. i think this is what they called quarry?